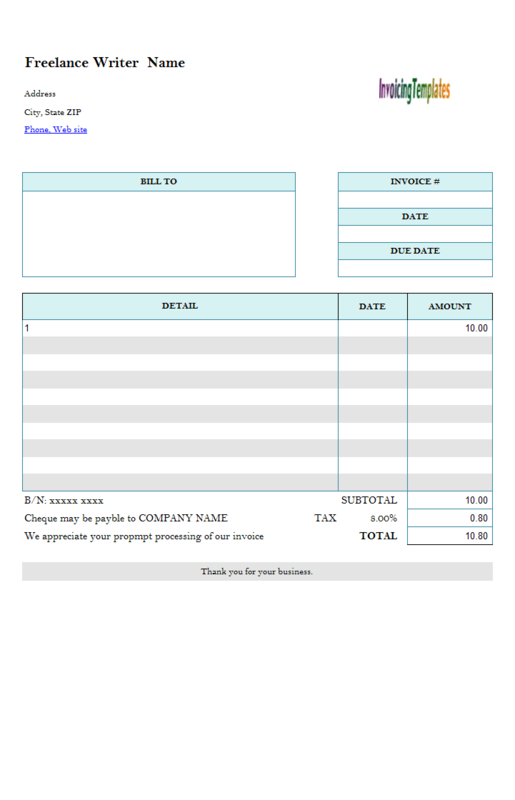 This sample for handyman billing helps you create professional bills for your business. The layout and format of this template is customized to apply one tax (GST) on services and two taxes (GST and PST) on goods. 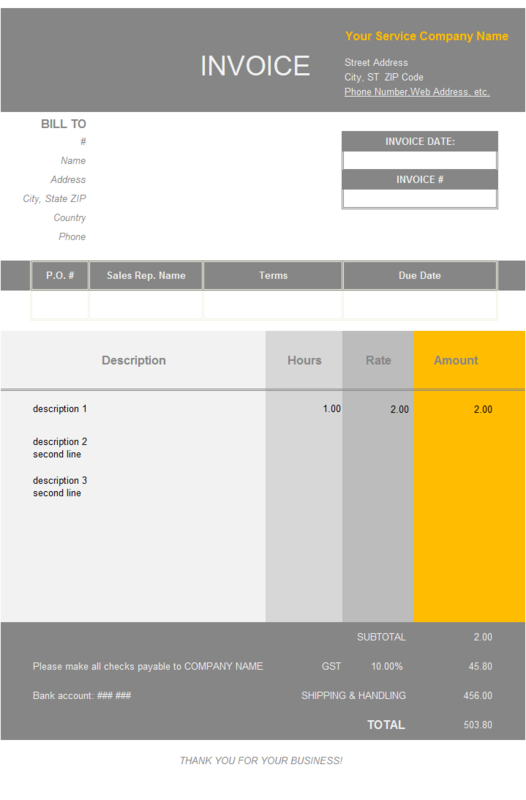 c7006 now includes the customized invoice template for the latest version of Invoice Manager for Excel. This is what you will see when you open handyman.xlsx. 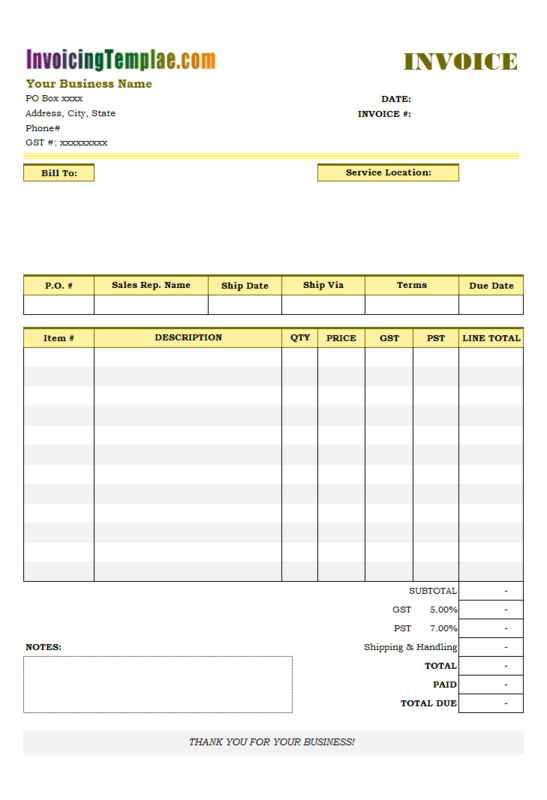 Note: If you would like to see a version of the handyman billing template that has no taxes set, please visit Handyman Invoicing Template (No Tax). 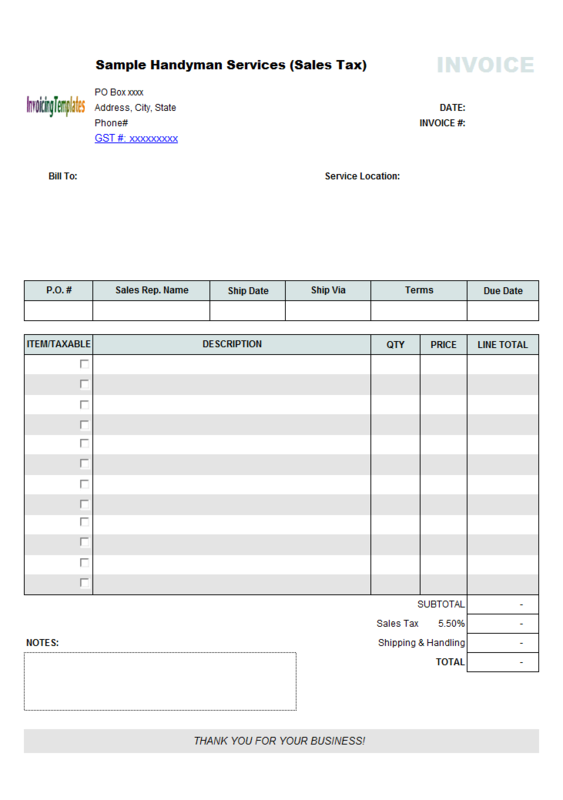 Or, if you prefer a single sales tax version, visit Handyman Invoicing Sample (Sales Tax). 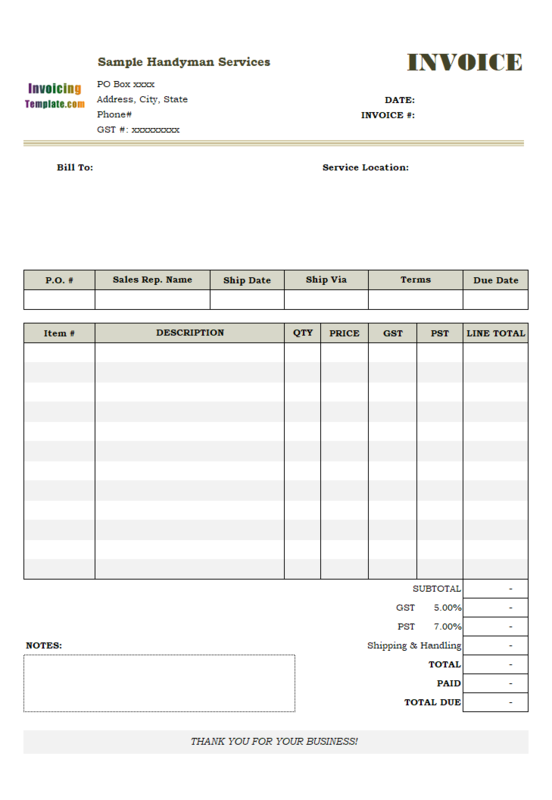 Since Handyman Billing Template is a service bill sample, the "Ship To" section found in the general templates now was now titled with "Service Location". Several other labels related to shipping, such as "Ship Date" are "Ship Via", are still there. You can replace these labels whatever you like to meet the requirements of your business. 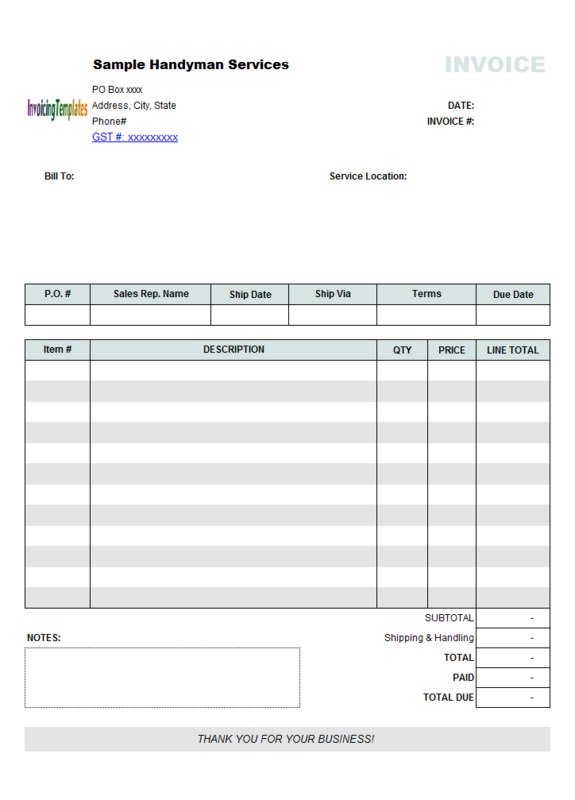 The invoicing detail section, which is also referred to as "Invoicing Body" here on InvoicingTemplate.com, is what is the special design appear. 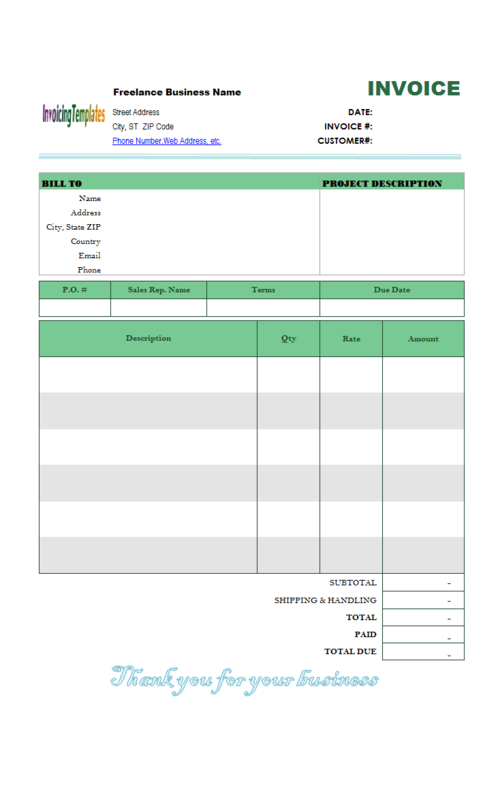 This Handyman Invoicing format offers 7 columns here that are Item #, Description, Quantity, Price, GST, PST and Line total. The item# field is here for you to enter the short code for the goods you sold or services you performed. 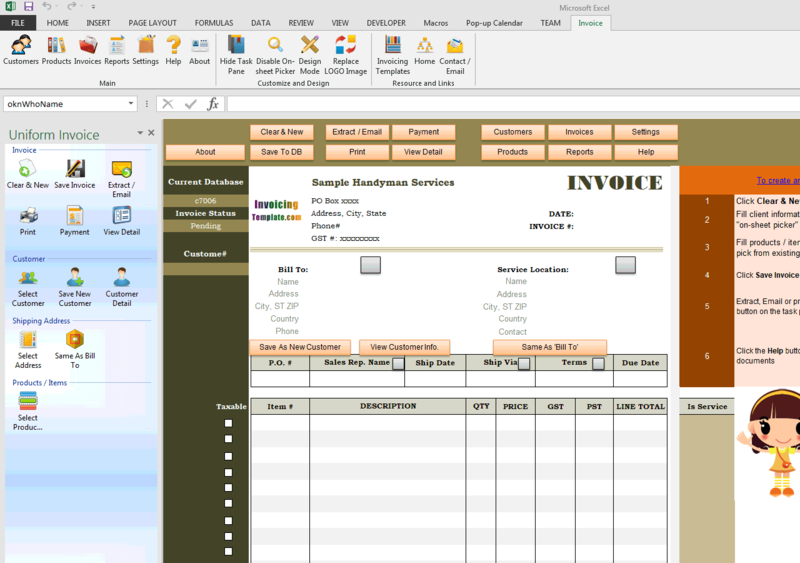 If you use the Invoice Manager for Excel (namely Uniform Invoice Software) (UIS) version of this invoicing template, which has exactly the same layout as the freeware edition but with many buttons on it, the item# cells are actually a handy way for you to enter item descriptions and prices. For example, you can save the product / service "fence repair" with the item# (or Product ID) "fr", and "window replacement" with the item# "wr". Once you need to invoice these items, just enter the code "fr" or "wr" into the item# cells, the fully description and unit price is automatically retrieved from saved records. This feature is called "in-cell lookup" in UIS and Excel Invoice Manager. With the default template shipped with UIS, two taxes are defined by default on the bottom of the invoicing form. However taxes defined on the default template are always either all applied on the item (if the item is taxable), or not applied at all. These is no way to apply only one tax on some items (such as service), and apply two taxes on the other items. 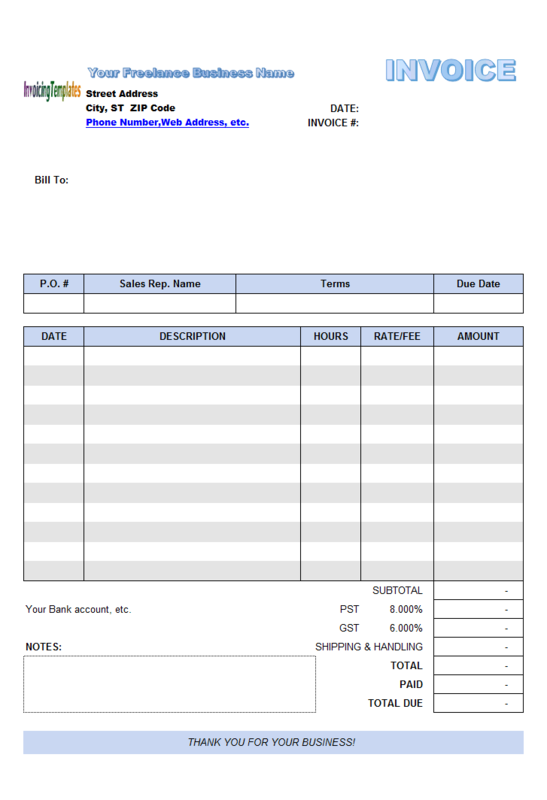 This customized handyman invoice template redefine the tax formulas, providing the ability to apply one tax (PST) on goods (materials), and apply two taxes (GST and PST) on both service (labor) and goods (materials). In order to implement the taxing rules, InvoicingTemplate.com added 3 custom fields to the "InvBdy" database table - "GST", "PST" and "IsService". The "IsService" field is corresponding to the "IsService" field defined in the Product database table, however with the default template it is not added to the Invoice Body, because the on-form calculation of taxes and totals does not depending on this field. 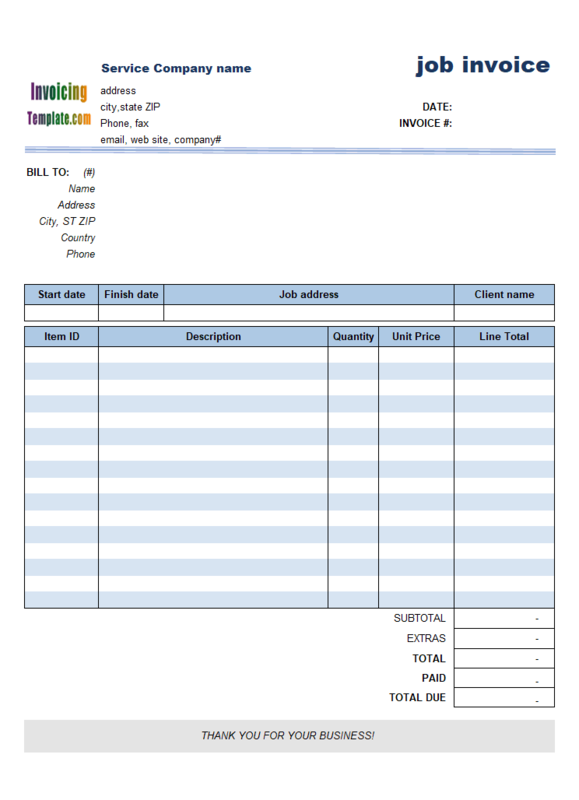 However with this invoicing template designed for handyman business, calculating the taxes requires to know the type of the invoicing item. When creating invoices and bills, filling in the "IsService" with the value 1 means the current item is a service, and thus only one tax will be applied on it. If you installed UIS, which can be downloaded for free from our invoicing software page, the type of the invoicing items will be filled in automatically when you pick up items. Note that although we have set the tax names to be "GST" and "PST", they could be anything that meet your business requirements. 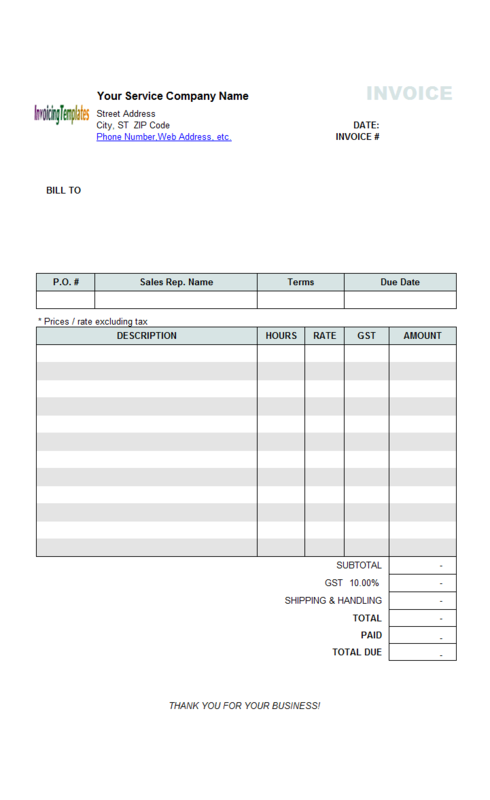 If you use the freeware version of this invoicing template, simply enter your tax names to replace GST and PST. 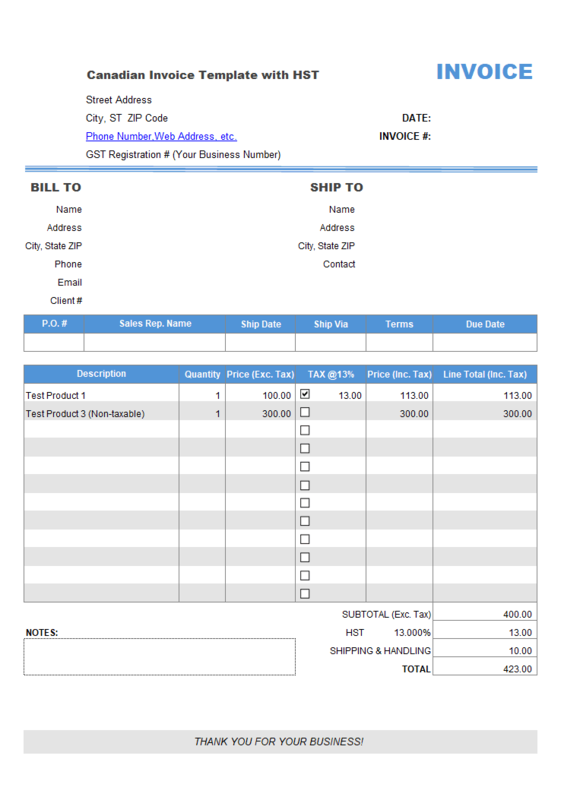 If you use the UIS version of this handyman invoice template, changing tax names is even simpler - click the Settings button, go to Taxes tab, enter the new tax names and tax rates, and then click Apply. 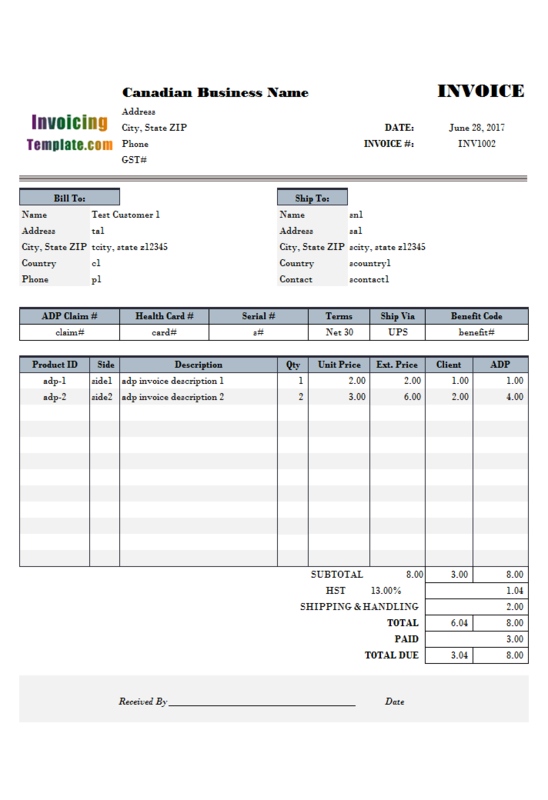 The UIS version of the template also provides detailed reports, such as customer statement. 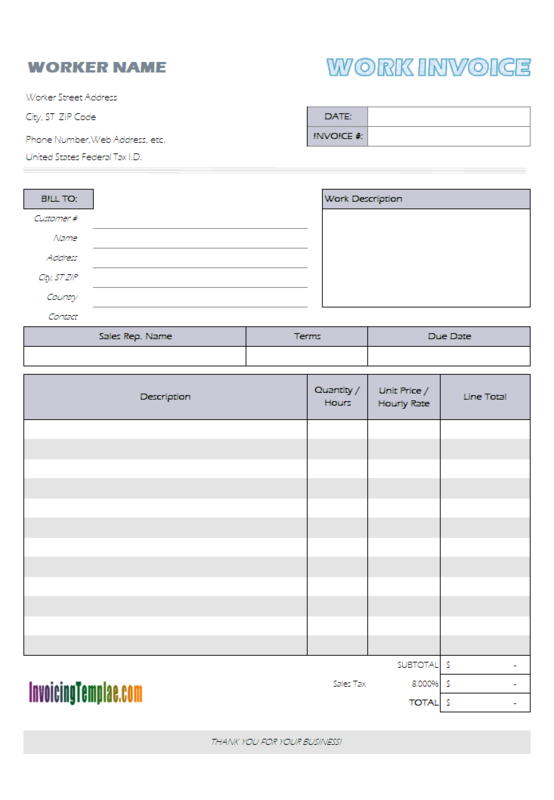 Like other form designs here on InvoicingTemplate.com, Handyman Invoicing Format is free (offered to you at a price of 0.00USD). It works on Windows XP and all newer versions of Windows, and Excel 2007, 2010, 2013 or 2016. Changed to use Excel themed colors. 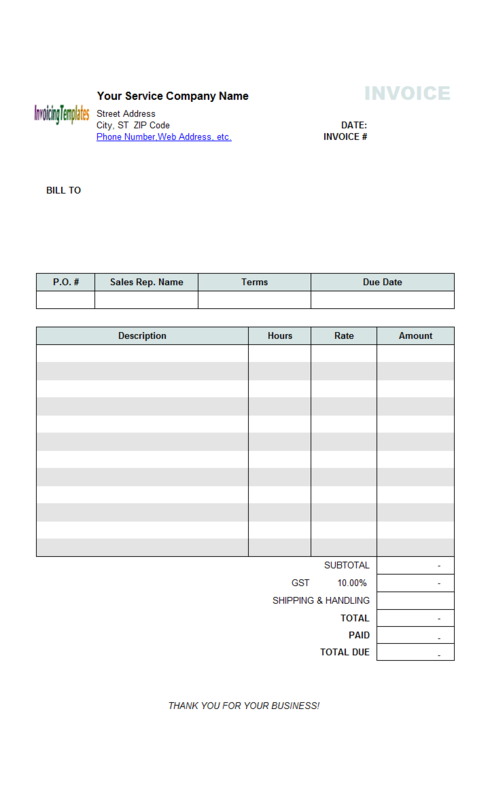 Made "Invoice#" and "Invoice Date" fields / cells larger. Updated the template handyman.xlsx so that it has a modern look and feel.